Marine and Security Programs | Fire / Reconstruction Consultants, Inc.
Fire/Reconstruction Consultants, Inc. was the first Origin & Cause Investigative Company to Specialize in Marine. We have conducted more than 1500 vessel fires and/or explosion investigations from 12’ runabouts to large ships, Factory Ships, Yacht Manufacturers, Marinas & Shipyards. It is important to know that Vessel Fires are totally different from Structure fires in the way they need to be investigated. Protecting divers from hazards such as hypothermia, decompression, drowning and accidental injury and often needing to overcome poor visibility and hostile/turbid water conditions makes the (ROV) the underwater camera of choice in operations down to 1,000 feet. The ROV (remotely operated vehicle) with its high intensity lights, scanning sonar, tether management system, and manipulator arms enables Capt. Godfrey to videotape and photograph the evidence – in depths divers dare not tread. An underwater ‘mighty eye,’ the ROV reveals exact conditions and whether divers can safely descend for further exploration. Even in shallow water, the ROV allows real-time processing of information which can eliminate unnecessary diving. With a solid foundation in aquatic research/farming, the ROV broadened its horizons after it was used to investigate the bombing of President Bush’s private boat and the sinking of the USS Arizona in Pearl Harbor. 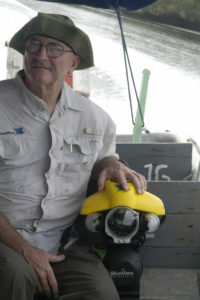 Its practical application for the underwater investigative field “exploded.” Steven Van Meter worked with an ROV as NASA’s hazardous-duty robotic specialist; his experience as former head of Kennedy Space Center’s security department and as a federal enforcement officer make him essential to Fire Reconstruction Consultants investigative team. 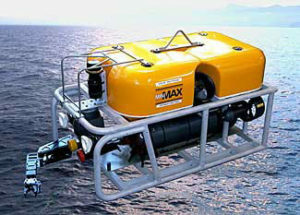 The ROV (small enough to fit in “large” breadbox) is only part of Capt. Godfrey’s high-tech tool kit which he transports to worldwide sites. As a side scan sonar (sss) technician, he finds missing pieces from a vessel which can travel through the water during the fire sequence. Side scan sonar is very accurate in its imaging – like a photo – using sound waves underwater. The Senior Investigator, Captain Walter Godfrey, started out INVESTIGATING with Pinkerton’s Detective Agency, over 40 years ago, in Charlotte, N.C., along with Management Training & Fire Investigations. As shared earlier, Capt. Godfrey was an AGENT, for Legislative Security, State of Florida, February 1973 to July 1974. Duties: Security of House, Senate and Capitol Buildings as well as security of Legislative personnel, such as Senators and Representatives in the event of threats on their lives or property. Duties also included bomb threat evacuation and bomb disposal techniques. Call Fire/Reconstruction Consultants, Inc., to discuss a Marine Investigation and/or Security assessment , plan or training.